Have had a rather exciting find for 2011. My father’s family of HILLENBRANDs in Syracuse started with grandfather Jacob HILLENBRAND coming from Markelsheim, Wuerttemburg in 1885. I have mentioned this before on this blog, and his photo can be seen on my main website at www.UNYG.com. Well last month I received an email from my new best friend, a genealogist that actually lives in Markelsheim and she offered to help! Wow, you should all be so lucky. This very kind lady went through the church record books and was able to take some of my Markelsheim lines back almost to the 1500′s. I had done the best I could with my self-taught Genealogical German when I used these same records on microfilm at LDS in Salt Lake city some 25 or 30 years ago. The earliest HILLENBRAND ancestor that I had recorded previously was a Caspar HILLENBRAND, a baker of Markelsheim with an estimated date of birth of about 1760 with no known location in Germany. His wife’s name was Barbara (PFAU), with no further information that I had been able to discover. So now with a native German researcher going through the same Catholic Church records she was able to locate his parents names and place of birth as another Caspar HILLENBRAND, also a baker of Röttingen, Wuerttemburg, Germany, which is only about 8 miles up the Taube River from where Markelsheim is located. So now I will be ordering the microfilms of Röttingen to see what I might find. This caused a light to go on in my noggin as Röttingen is right on the border with Bavaria. The reason that is so exciting to me is that there was another family of HILLENBRANDs in Syracuse that came in 1866, and for many years I have always told every one that we are not likely related as they were from Bavaria and my direct line was from Wuerttemburg . So fortunately I have been working on the “other” HILLENBRAND family off and on, with quite a bit more research in the past month as I bought the book, “Unbroken” by the best selling author, Laura HILLENBRAND, (she also wrote “Seabiscuit”), and it turns out she is a descendant of this same “other” HILLENBRAND family in Syracuse. Now we get to the title of this Blog post and what it has to do with the World War I Draft Registration Cards. This excellent collection of some 24 million names of men that registered for the draft has been available on Ancestry.com for quite a number of years now and it has been very helpful in finding dates of birth and many other details like nearest relative, occupation and more. If you have used these draft cards online before you will have noted that they are often quite hard to read as the image quality is very poor. Usually you are able to read it well enough to get some of the data and it is helpful. So I found a card on Ancestry of an Anthony HILLENBRAND and lo and behold it listed his father’s place of birth as [unreadable] Bavaria, Germany. So I downloaded the image and ran it through photoshop, and enhanced it the best I could by sharpening the edges and altering the brightness and contrast and still the best I could guess at were names something like; Nissisedicl, Rissiuqid, Kissiseaicl, and about a half-dozen other total meaningless spellings. Then I decided to dig deeper on these draft cards, and discovered that the National Archives southeast Region Branch near Atlanta has high quality scans available to purchase online. It is really quite easy. All you have to do is set up an account and this same account may be used for future purchases. I ordered a digital download copy of Anthony’s card for five dollars and was told that it would be 4 to 5 days. I ordered yesterday, Sunday, and the order was ready today, Monday! Well Bingo! The card is very clear to read and the name of the town is “Kissengen”, Bavaria, Germany. It is too soon to be sure but at first check of Google maps and an old World Gazetteer it is most likely Bad Kissengen which is just a little northeast of Würzburg, and as Markelsheim is just a little southeast of Würzburg, so we just might have a connection after all. I will be trying to locate church or civil records of Bad Kissengen and for some reason it does not seem to be a place name that is in the LDS film catalog by doing a place search. I will find it for sure, this has all just happened today! Turns out the two towns are only about 68 miles apart. 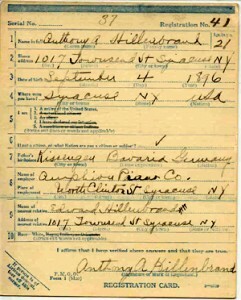 In reading the description of the National Archives WW I Draft Cards they note that there were three different series of these cards issued in 1917 and 1918, and only one short group asked for the name of the father’s birth place, so we were indeed fortunate that Anthony registered when he did. Here are comparisons of the two different scans. 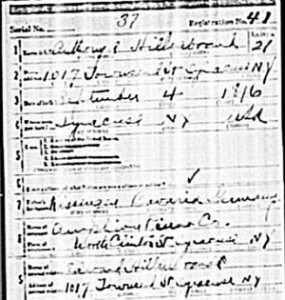 Note the ancestry version is so compressed digitally that much of the card is hard to read, but a good high def scan of the original record is excellent. Five dollars well spent and you all might want to do the same on some of those hard to read draft cards. Glad you liked it Jack. Just received in the mail the actual photocopy of the digital scan that they had sent me by email. A pretty good deal for five bucks.